The Spicemas Corporation, the official organisers of the Grenada Carnival, today introduced its first mobile app for Android and Blackberry devices in Grenada. This free app will keep users up-to-date with news, photos, videos and events from The Spicemas Corporation social media sites, Facebook, Twitter, Flickr and YouTube. 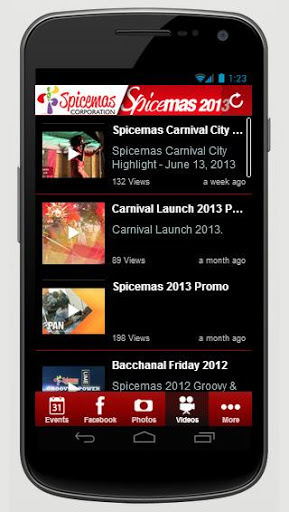 The app called Spicemas 2013 enables users to stay informed across all up and coming events and enjoy images, audio and video from events such as Carnival City, Panorama, Bomb Tune and the ever popular Soca Monarch heats and final. Even after the Carnival season is over the app will continue to keep users up-to-date with carnival related information right up until the launch of Spicemas 2014. App Developer Dari Twum-Barimah said, “Technology is not supposed to keep us apart but bring us together and this app is the perfect example. With my colleague, Rohan Benard, we have designed the app to give all users a full picture of what Spicemas 2013 has to offer and to amplify the effects of carnival on each and every person. Users can also make use of a playlist with the latest Soca tunes, or explore a tab dedicated to sponsors which leads to the sponsor website. There is also a form if they feel they need to contact a member of the Spicemas Committee. Android phone owners will have the additional benefit of not only seeing what events are happening but will be guided to the location with Google Maps. They will also benefit from push notifications which allows them to receive Spicemas 2013 generated messages on current events, highlights and any other updates via a built in app messenger.